We used to live in a tiny flat in Levenshulme when we first moved to Manchester in 2005. 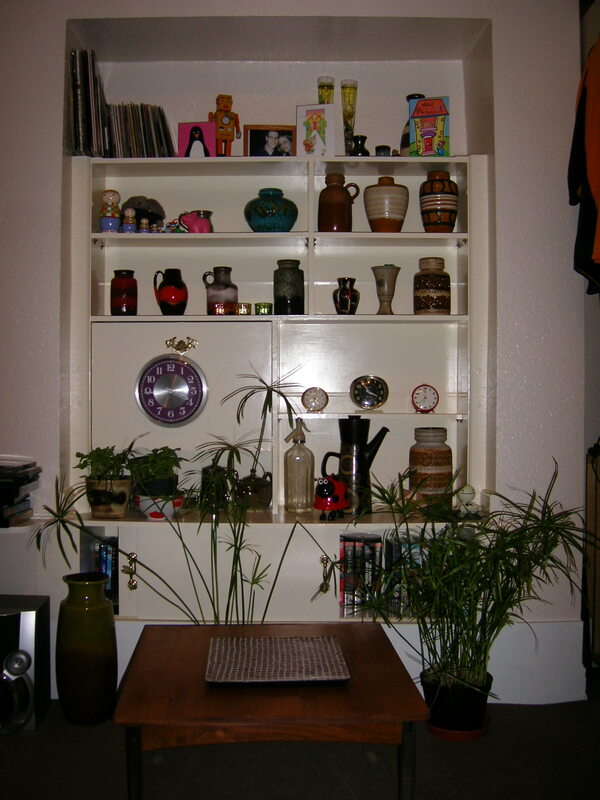 This was the little display area we had for our (then) very meagre collection of pottery and other retro bits and bobs. You can see the start of my Westclox collection – now boxed away in the loft; Aidan’s Kelloggs bowl which he used to love; a Denby ‘Arabesque’ coffee pot which I bought for a pound from a jumble sale and sold for £12 on Ebay; the coffee table we bought for a few pounds from a Levenshulme charity shop (Aidan spent hours sanding and polishing it! ); finally, our first ever West German pot on the bottom right hand corner. Wish us luck for this trip! See you soon!